Pulev-Dinu and Magdaleno-Ramos will be televised live on ESPN and ESPN Deportes at 10 p.m. ET/7 p.m. PT. 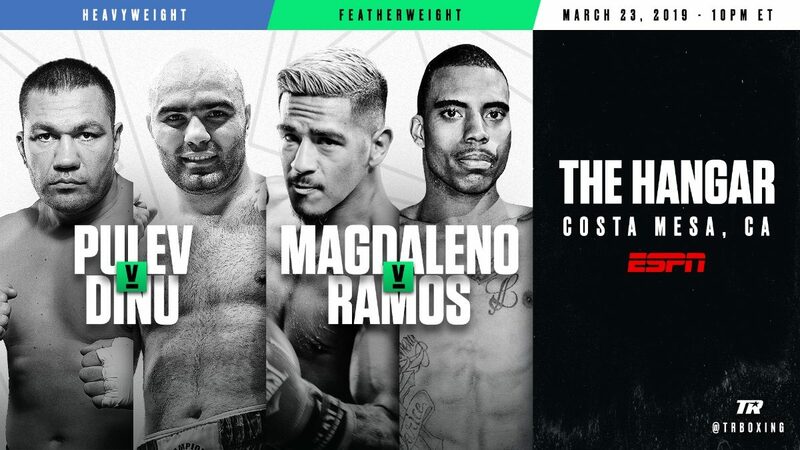 The entire undercard, including the return of top junior welterweight contender Maxim “Mad Max” Dadashev against Ricky Sismundo, will stream live on ESPN+ beginning at 6:30 p.m. ET/3:30 p.m. PT. Pulev (26-1, 13 KOs) is closing in on a second world title shot, the first coming in 2014 when he put up a valiant effort before being stopped by longtime champion Wladimir Klitschko in the fifth round. He has won six straight since the Klitschko loss, most recently defeating fellow contender Hughie Fury via unanimous decision in front of his hometown fans at the Arena Armeec in Sofia, Bulgaria. Dinu (18-1, 14 KOs), a one-time top amateur in his native Romania, will be making his second ring appearance in America. He is looking to bounce back from a fourth-round stoppage loss to Jarrell Miller. Magdaleno (25-1, 18 KOs) will be fighting for the first time since Isaac Dogboe snatched the WBO junior featherweight world title from him last April in a Fight of the Year contender. Dogboe bounced back from a first-round knockdown to stop Magdaleno in the 11th round. Magdaleno, who had difficulty making the 122-pound limit, hopes a win over Ramos propels him toward a featherweight world title shot. Ramos (30-5, 14 KOs) captured the WBA super bantamweight title on July 9, 2011 in Atlantic City with a stunning one-punch knockout of Akifumi Shimoda. He lost the title the following January to Guillermo Rigondeaux via sixth-round knockout. Ramos has been on a hot streak since a 2015 knockout loss to Claudio Marrero, winning six in a row while campaigning at both super bantamweight and featherweight. He won a pair of fights in 2018, including an eight-round unanimous decision over Daniel Olea last September that streamed on ESPN+. Javier Molina (18-2, 8 KOs), who represented the United States at the 2008 Olympics, will face knockout artist Abdiel Ramirez (24-3-1, 22 KOs) in a super lightweight bout scheduled for 10 or eight rounds. Ramirez is coming off a stunning knockout victory over Michael Perez on the Vasiliy Lomachenko-Jose Pedraza undercard Dec. 8 in New York City. Detroit product and surging 130-pound contender Erick De Leon (18-0-1, 10 KOs) will fight Jose Luis Gallegos (16-5, 12 KOs) in a dual set for 10 or eight rounds. De Leon hasn’t fought since July 14 when he suffered a shoulder injury in a decision win versus Adrian Young. Longtime welterweight contender Chris “The Heat” van Heerden (26-2-1, 12 KOs) will fight battle-tested veteran Mahonry Montes (35-8-1, 24 KOs) in a bout scheduled for 10 or eight rounds. Top featherweight prospect Tyler McCreary (15-0, 7 KOs) will make his Top Rank debut against Roberto Castaneda (23-11-1, 16 KOs) in a contest scheduled for eight or six rounds. David Kaminsky (3-0, 2 KOs), the 18-year-old former amateur standout, will fight Estevan Payan (1-6-1, 1 KO) in a four-round middleweight bout. Payan has also fought 30 times as a professional mixed martial artist. Bobirzhan Mominov (9-0, 8 KOs) will aim for his fifth consecutive knockout against Jonathan Steele (9-2-1, 6 KOs) in a welterweight battle scheduled for six or eight rounds. Lightweight prospect Eric Puente (1-0) will return in a four-rounder against Alejandro Lopez (1-3, 0 KOs). Use the hashtag #PulevDinu to follow the action on social media.